The large flange hexagonal European style rivet nut is often used in high-load and high-torque applications. The large flange provides increased strength and better containment of round or oversized holes. They are typically installed with standard spin/pull tools and require no additional special tooling. These industrial fasteners are offered by JHP Fasteners in a wide variety of materials and thread sizes. * Not available in 304 Stainless Steel ** Not available in 316 Stainless Steel Note: A variety of rivet nut lengths also available. 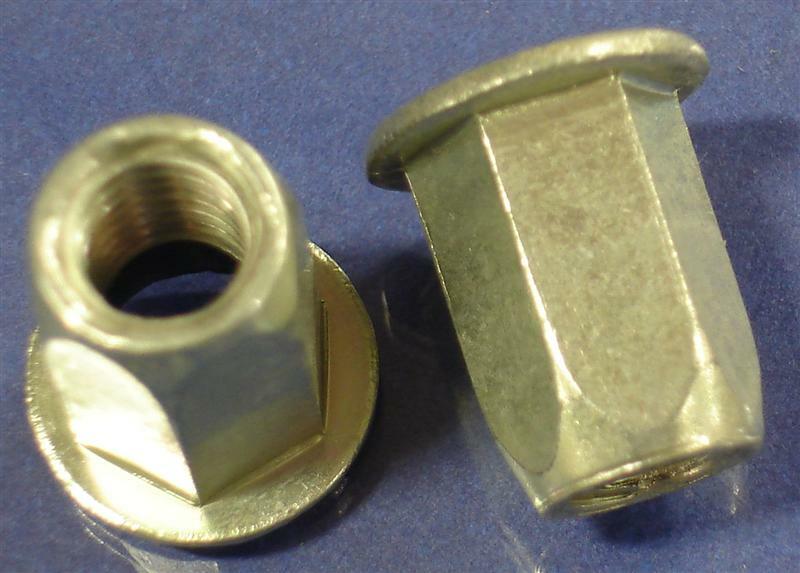 The grip range of these rivet nuts can be affected by the type of sheet material being used. It is recommended that a few test installations be conducted to determine the appropriate grip range for your specific application. Installation of the large flange hexagonal European style rivet nut is accomplished via use of hand tools that can be pneumatic, hydraulic, or manual. When properly inserted, these industrial fasteners provide excellent load and torque performance. The closed-end version of this rivet nut is a good choice when a barrier against external contamination is required. These rivet nuts are easy to use, reliable, and versatile. If you have questions regarding which style of rivet nut to use for your application, JHP Fasteners will be able to assist you in the selection of a nut that will satisfy your requirements. We will also provide you with pricing and delivery terms that will be difficult to beat.